What is vinyl used for? As the material of choice for blood bags and medical tubing, vinyl helps to maintain the world's blood supply and supports critical healthcare procedures such as dialysis. As a packaging material, vinyl helps to keep meats and other foods safe and fresh during transportation and on store shelves, and it provides tamper-resistant packaging for food, pharmaceuticals and other products. Because it will not rust or corrode and breaks far less frequently than alternative materials, vinyl is widely used in water pipes to deliver clean, safe-to-drink water and in sewer pipes to ensure the integrity of wastewater handling systems. Vinyl's resistance to breakdown under high electrical voltage and its ability to bend without cracking make it the leading material for wire and cable insulation. As an underbody coating on automobiles, vinyl has helped to add years to the life of motor vehicles. Vinyl's toughness and durability make it the most widely used plastic for building and construction applications such as siding, windows, roofing, fencing, decking, wallcoverings and flooring. These are just a few of the myriad, cost-effective uses of vinyl in everyday life. Yes. Vinyl (or PVC) has been used in products for decades without any evidence of harm to human health. 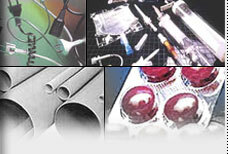 Vinyl is used in medical products such as blood bags and medical tubing and in such food-contact applications as meat wrap, bottles and can enamel. These products are regulated for safety by the U.S. Food and Drug Administration. According to Bruce Burlington, MD, director, FDA's Center for Devices and Radiological Health (CDRH), "We believe that IV bags, blood administration sets and other uses of PVC including dialysis tubing are safe" (Boston Globe, Feb. 22, 1999). Alternative materials may not be available or may not offer the important performance characteristics that vinyl offers for these and other uses. This point was made by David Feigal, MD, medical deputy director, FDA's Center for Biologics Evaluation & Research (CBER), who said, "
we would need to see a substantial amount of testing to make sure we weren't moving from a product with good characteristics to one that we don't know very much about" (Washington Post, Feb. 22, 1999). In another example of its safety, vinyl is used in pipes certified to meet American National Standards Institute/National Sanitation Foundation Standard 61 for safe use in drinking water service. How are vinyl industry workers and surrounding communities protected? All vinyl manufacturing facilities are closely regulated by the federal Occupational Safety and Health Administration (OSHA) and the Environmental Protection Agency (EPA). Workplace exposure limits are highly protective. The industry uses an enclosed process to produce vinyl that minimizes environmental releases and worker exposure to vinyl chloride (VCM). Vinyl manufacturers are also required to have ongoing training programs and safety drills that keep employees prepared and protected. What risk does the public face by having a vinyl chloride manufacturing facility in its midst? Since the 1970s, individual manufacturing plants have conducted monitoring of surrounding communities to identify potential exposures to nearby residents from the vinyl production process. Several independent studies have also been undertaken to determine an association between exposure to vinyl chloride (VCM) and cancer in the general population. These include studies conducted by the U.S. Centers for Disease Control and specific reviews conducted in the states of New York and Wisconsin, as well as in Great Britain, Sweden, Holland and Canada. Representatives of the U.S. EPA have stated that the agency has been unable to establish a link between living near a VCM/PVC plant and angiosarcoma, a rare form of liver cancer associated with high exposure to vinyl chloride. How are vinyl manufacturers protecting the environment? Over the past several years, vinyl production has risen while environmental releases associated with production and disposal have fallen. This is due in part to the fact that vinyl has been regulated for decades, ensuring that workers, local communities and the environment are protected at each step in the life cycle of the material and the products made from it. Just as important, the vinyl industry instituted its own voluntary programs to improve manufacturing efficiencies and reduce emissions - extending the impact of government efforts even further. The vinyl industry supported strict federal standards for incinerators that are now being phased in.